It’s all about Oz this weekend Oz-Stravaganza Co-Director Colleen Zimmer said, “We’ve gone from books and to movies and to other authors continuing the series and to After the Wizard, The Wiz, Wicked, I mean it just keeps going in all directions and just grows and grows and grows.” Most of the Oz-Stravanza events will get started this afternoon with fireworks capping off the night at 9:30 p.m. You’re also encouraged to stop by the “All Things Oz” museum to check out some very cool exhibits. 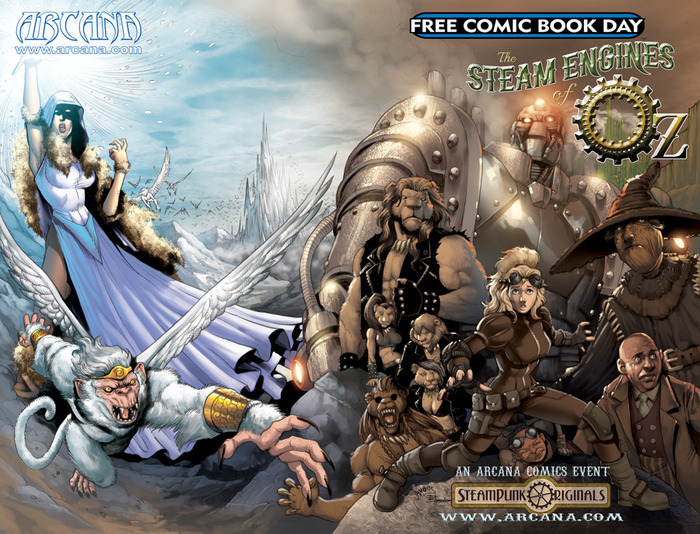 The Steam Engines of Oz original graphic novel The Steam Engines of Oz is a family-friendly, EPIC SteamPunk infused story, set 100 years after the events of The Wizard of Oz. A lot has happened in the Land of Oz since Dorothy’s departure, clicking her heels together and saying, “there’s no place like home!” Created by Sean Patrick O’Reilly (CLOCKWORK GIRL, KADE, EZRA, PIXIES) and Erik W Hendrix (DEADLY HARVEST, THE EVIL TREE, THE BOOK, CHAMPIONS OF THE WILD WEIRD WEST), with art from Yannis Roumboulias (DEADLY HARVEST) and colors from Chandran (INTRINSIC), our story follows young Victoria Wright, who works beneath the Emerald City, making sure the vast machines below the city keep running. She finds out, however, that her actions, which seem so small, actually have much larger implications. Along the way, we find out what happened to some of the beloved characters from The Wizard of Oz and other stories set in the Land of Oz, as well as meeting new characters. So, what happened to the Tin Man, Scarecrow, the Wizard of Oz himself, and others? Well, you need to read the book to find out! ‘Patchwork of Oz’ This Year’s Theme of Oz-Stravaganza A total of 21 special guests will make appearances throughout Oz weekend including cast members from the film “After the Wizard,” Jordan VanVranken, Jermel Nakia and Orien Richman. Also appearing will be Hugh Gross, writer and director of the film. Judy Garland’s movie stand-in, Caren Marsh-Doll, Munchkin by marriage Myrna Swensen, L. Frank Baum’s great grandson Bob Baum and his wife Clare will all be returning guests. Another of L. Frank Baum’s great grandsons, Roger Baum, and his wife, Charlene, will return to Chittenango for the first time in a few years to speak about the new Oz animated movie to be released next year based on Roger’s book Dorothy of Oz. From the recently released Disney movie Oz the Great and Powerful Quadling child Ann Marie Arcuri and Wizard stand-in Al Jakel will be an exciting addition to the festival. New guests to Oz-Stravaganza! are movie critic Ryan Jay and the expert on the 1903 Wizard of Oz musical David Maxine. 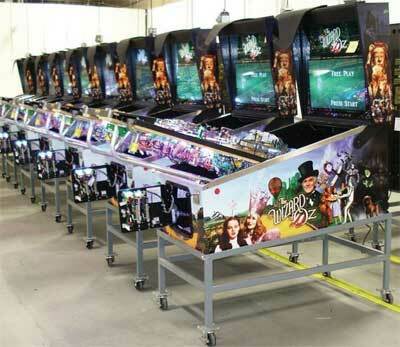 New Pinball Machine is a Game Changer for the Industry: We’re Not in Kansas Anymore After a 2+ year journey down the Yellow Brick Road, New Jersey based Pinball Manufacturer, Jersey Jack Pinball, Inc. (JJP) has started shipment of their much anticipated first game, The Wizard of Oz Pinball Machine. Games have started to make their way from the company’s 42,000-sq foot building in Lakewood, NJ to over 1,400 customers worldwide who have pre-ordered the machine. 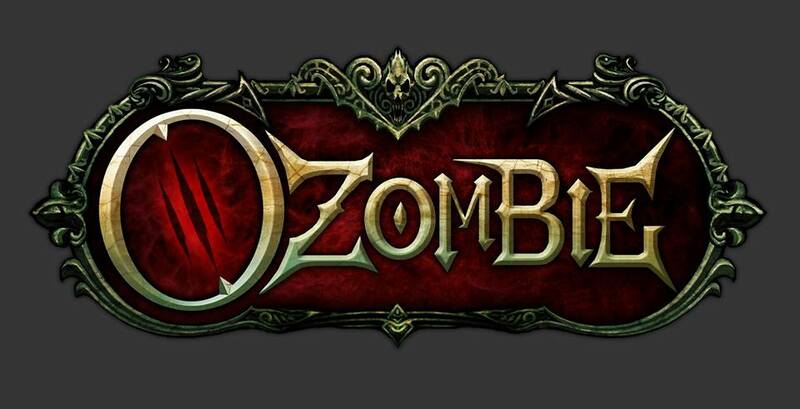 The game includes a magnetized flying monkey that scoops up your ball, Dorothy’s house which spins and drops on the feet of the Wicked Witch of the East, a crystal ball that displays animations through a small backlit LCD monitor, ruby red “slipper flippers,” and countless other aspects of the classic movie. Farnsworth Presents The Wonderful World of Oz Exhibition on 75th Anniversary of Iconic Film To coincide with the 75th anniversary of Metro-Goldwyn-Mayer’s classic motion picture The Wizard of Oz, the Farnsworth Art Museum will open the exhibition, The Wonderful World of Oz, on Saturday, October 12, 2013. 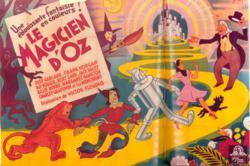 The show, drawn from the world’s most comprehensive collection of Oz materials, which is based in Maine, will run through spring 2014 in the museum’s Crosman Gallery. Included in the Farnsworth exhibition will be the most complete surviving costume (worn by the green Lollipop Guild Munchkin), one of Dorothy’s pinafores and blouses, examples of the many illustrated versions of Baum’s books (including the finest known copy of the first edition, first state “green imprint” of Baum’s initial book in the series), rare or one-of-a-kind posters from the various motion picture and stage productions, and a remarkable array of other Oz memorabilia from the Willard Carroll / Tom Wilhite Collection. Among the major pieces to be displayed is the Hourglass that the Wicked Witch of the West uses in the 1939 film to show Dorothy “how much longer you have to be alive.” Margaret Hamilton, who played the witch, lived during her later years on Cape Island, off Newagen, Maine. Lost Girl a new take on the Wizard of Oz The Massey University Drama Society will celebrate 50 years with a production of Lost Girl. Written and directed by Div Collins, winner of the Manawatu International One-Act Playwriting Award in 2008 and 2010, the play is loosely based on characters and events from the 1939 film, The Wizard of Oz. Dorothy Gale is a lonely 30-something who receives a mysterious parcel containing a familiar blue dress and ruby slippers. She is given directions to follow through the city, and on the way reunites with friends she hasn’t seen since childhood. While adult-Dorothy travels, we also see her and her friends as they last played – a final thrilling journey in Oz. They move deep into the forest of broken clocks, a place where time goes funny and the yellow-brick road may not be the road to follow. Behind the scenes: Oz the Great and Powerful By January 2012, edits of live-action footage began reaching Sony Pictures Imageworks. Simultaneously, work began on some of the film’s more complex digital environments. It was an evolving process, and part of this creative evolution was in terms of the film’s 3D demands. Scott Willman, the film’s stereography supervisor, came on board immediately after the principal photography was complete, for which the on-set 3D stereographers had been Ed Marsh and James Goldman. One of Wilman’s key responsibilities was to oversee how animated characters would tie in with the movie’s 3D aesthetic. Willman recalls that Raimi’s feedback upon reviewing the 3D footage was to “make it bigger”. Judy Garland’s actual Dorothy dress comes to Ireland For every Irish person The Wizard of Oz is an obligatory Christmas watch and a childhood favourite. This summer get closer to the star than you ever could have imagined by visiting the Newbridge Silverware Museum of Icons in Dublin to see their new temporary Garland display. The blue and white gingham pinafore costume worn by Garland in her most memorable performance as Dorothy, which recently sold for a record sum of $480,000 USD, is on display from May 22nd- July 31st. Studio Behind Animated ‘Wizard of Oz’ Sued for $1.2M It doesn’t always pay to follow the Yellow Brick Road. Daniel Zucker is suing Gigapix Studios in Los Angeles Superior Court and alleging securities fraud and breach of contract over a $700,000 loan related to a planned computer-animated version of “The Wizard of Oz.” Zucker claims Gigapix never repaid the money in his lawsuit. Zucker also invested money in the film and is seeking $1.2 million in damages and attorney’s fees. Louna Release ‘Oz’ Themed Video For “Business” Russian rockers Louna have released a heavily loaded video for “Business”. Based heavily upon the Wizard Of Oz mythos, the video takes the militaristically atheistic lyrics and combines them with politically charged imagery. In the video, two warring factions of munchkins use any means to kill one another, including bombs, balloon explosives, and suicide vests. Meanwhile, the Wizard watches over as a mask, no expression present as senseless slaughter after senseless slaughter is committed.